HOLIDAY SING A LONG by Mrs. HEndrickson. DREYDL C G7 I have a little dreydl, I made it out of clay, C And when it’s dry and ready, then dreydl I shall. 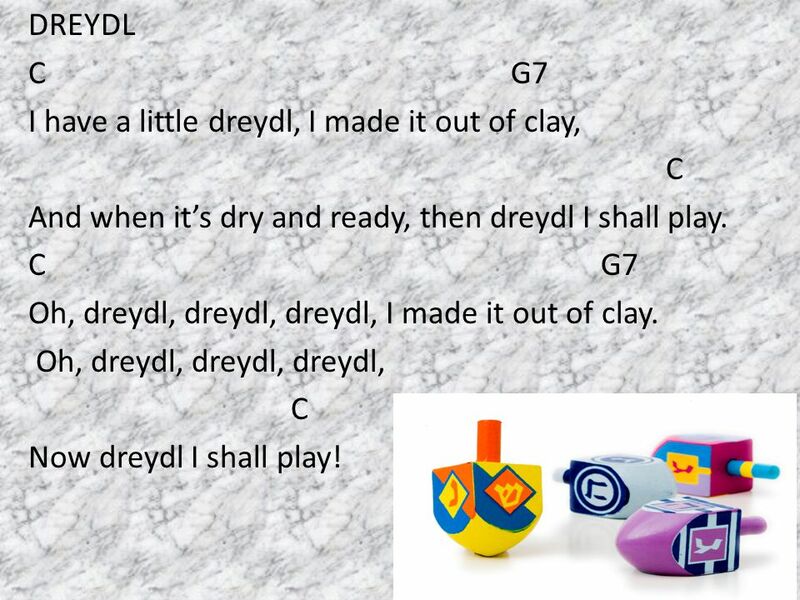 2 DREYDL C G7 I have a little dreydl, I made it out of clay, C And when it’s dry and ready, then dreydl I shall play. C G7 Oh, dreydl, dreydl, dreydl, I made it out of clay. Oh, dreydl, dreydl, dreydl, C Now dreydl I shall play! 4 JINGLE BELLS C Dashing through the snow, F In a one horse open sleigh. G7 O’er the fields we go, C Laughing all the way! C Bells on bobtail ring, F Keeping spirits bright. 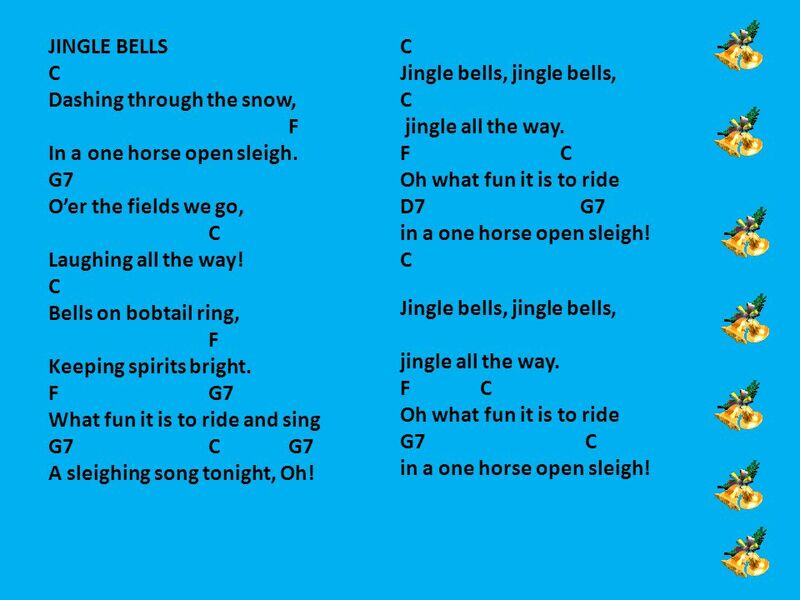 FG7 What fun it is to ride and sing G7CG7 A sleighing song tonight, Oh! C Jingle bells, jingle bells, C jingle all the way. FC Oh what fun it is to ride D7 G7 in a one horse open sleigh! C Jingle bells, jingle bells, jingle all the way. FC Oh what fun it is to ride G7 C in a one horse open sleigh! 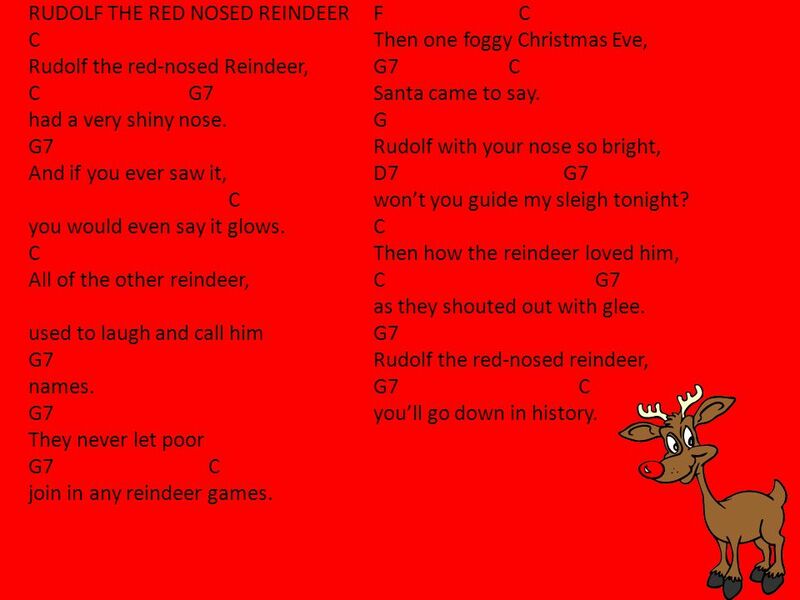 5 RUDOLF THE RED NOSED REINDEER C Rudolf the red-nosed Reindeer, CG7 had a very shiny nose. G7 And if you ever saw it, C you would even say it glows. C All of the other reindeer, used to laugh and call him G7 names. G7 They never let poor G7 C join in any reindeer games. 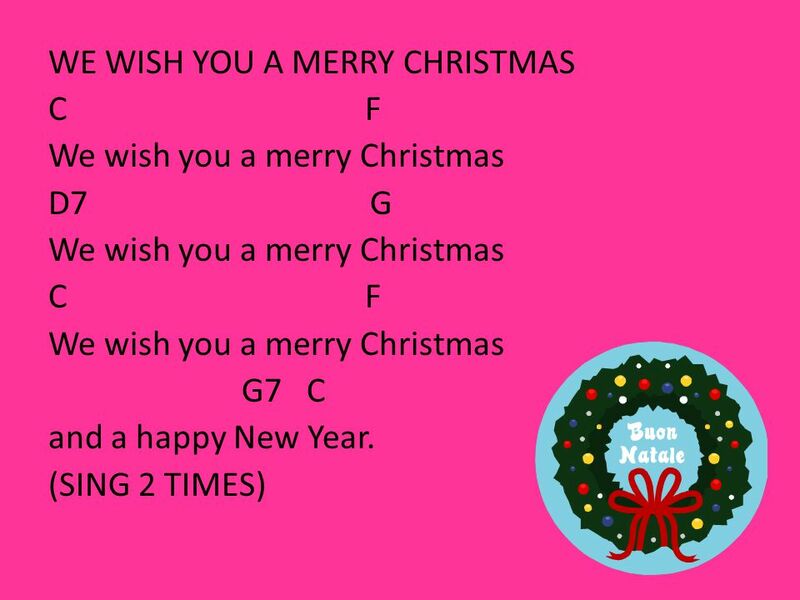 F C Then one foggy Christmas Eve, G7 C Santa came to say. G Rudolf with your nose so bright, D7 G7 won’t you guide my sleigh tonight? C Then how the reindeer loved him, C G7 as they shouted out with glee. G7 Rudolf the red-nosed reindeer, G7 C you’ll go down in history. 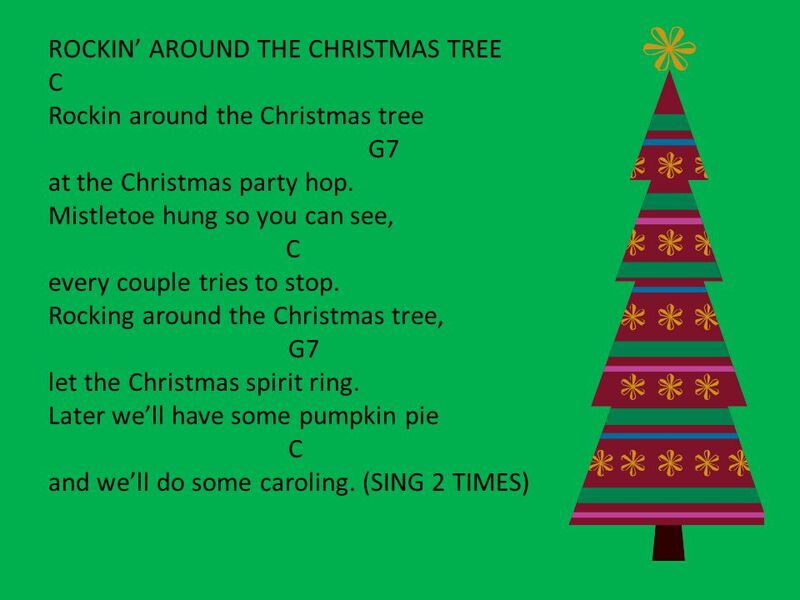 7 Deck The Halls C Deck the halls with boughs of holly, G7 C fa la la la la la la la la. C Tis the season to be jolly. G7 C fa la la la la la la la la. G7 C Don we now our gay apparel, C G7 fa la la la la la la la la. C Troll the ancient Yule- tide carol. F C G7 C fa la la la la la la la la. 8 UNITY C F C G7 Look at momma, look at daddy, look at baby, what a family. C F Look at momma, look at daddy, look at baby, C G7 C A loving family growing stronger in unity. 9 MUST BE SANTA G D7 Who’s got a beard that’s long and white? Santa’s….. G D7 Who comes around on a special night? Santa…. G Special night, beard that’s white. CHORUS C D7 G Must be Santa, G D7 C D7 G Must be Santa, Santa Claus. G D7 Who’s got boots and suit that’s red? Santa… G D7 Who wears a long cap on his head? Santa… G Cap on head, suit that’s red, special night, beard that’s white. CHORUS G D7 Who’s got a great big cherry nose? Santa’s….. G D7 Who laughs this way ho, ho, ho? 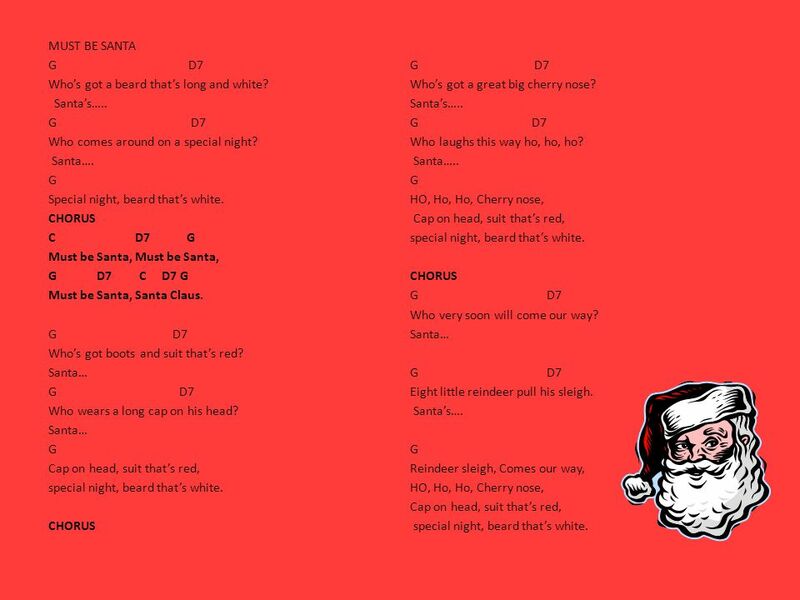 Santa….. G HO, Ho, Ho, Cherry nose, Cap on head, suit that’s red, special night, beard that’s white. CHORUS G D7 Who very soon will come our way? Santa… G D7 Eight little reindeer pull his sleigh. Santa’s…. G Reindeer sleigh, Comes our way, HO, Ho, Ho, Cherry nose, Cap on head, suit that’s red, special night, beard that’s white. 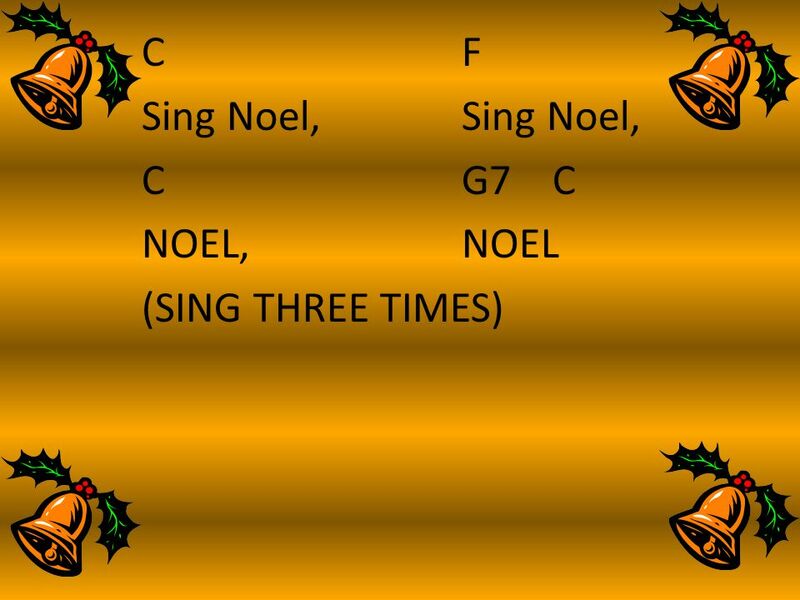 10 Ode To Joy C G Come and sing a joyful chorus. C G Lift your voices to the sky. C F Helping hands all join in friendship, C G C Keeping hearts and spirits high. 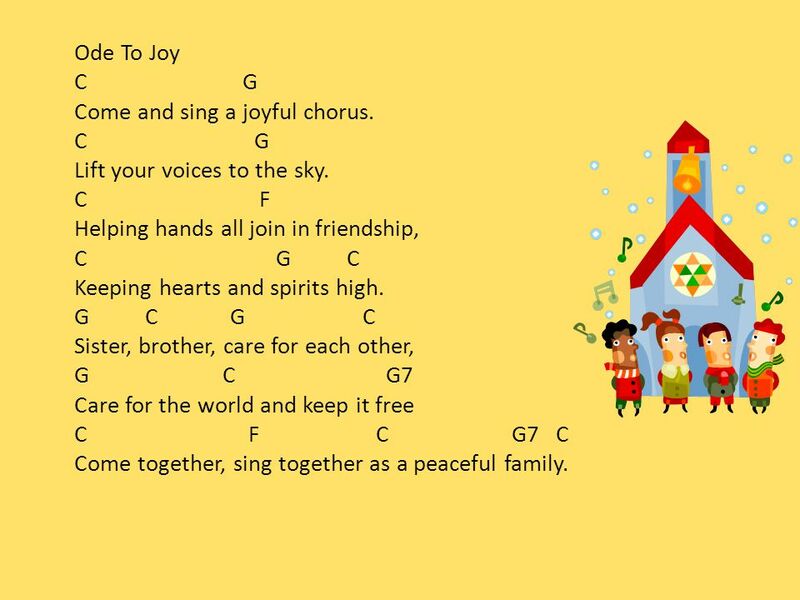 G C Sister, brother, care for each other, G C G7 Care for the world and keep it free C F C G7 C Come together, sing together as a peaceful family. 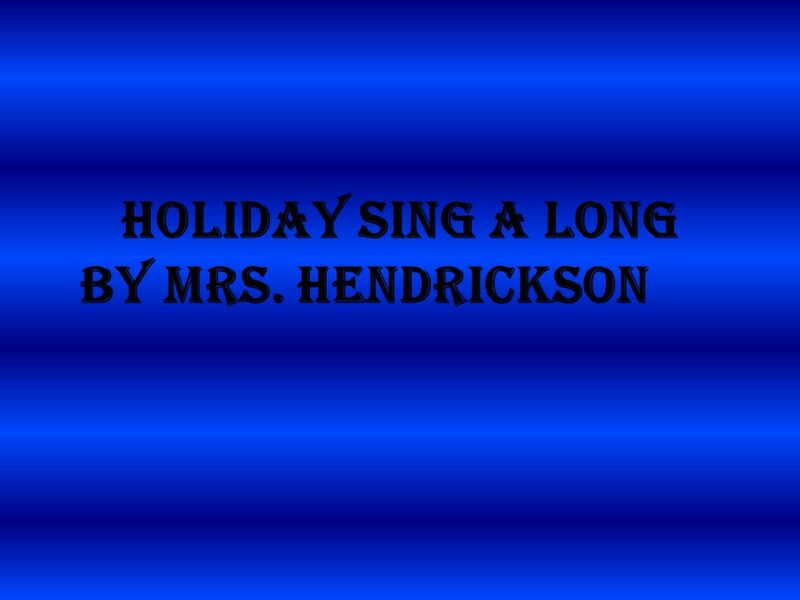 Download ppt "HOLIDAY SING A LONG by Mrs. HEndrickson. DREYDL C G7 I have a little dreydl, I made it out of clay, C And when it’s dry and ready, then dreydl I shall." Christmas Traditions in Britain. English traditions are quite different from Portuguese ones. For instance, English children don´t put shoes near the. Woodland Heights School presents: A Holiday Sing-a-long. CHRISTMAS ABC DO YOU KNOW CHRISTMAS WORDS? SANTA CLAUSE CHRISTMAS TREE REINDEER CANDLE SLEIGH CARROL l CHRISTMAS CARD CHRISTMAS STOCKING BELL CANDY. 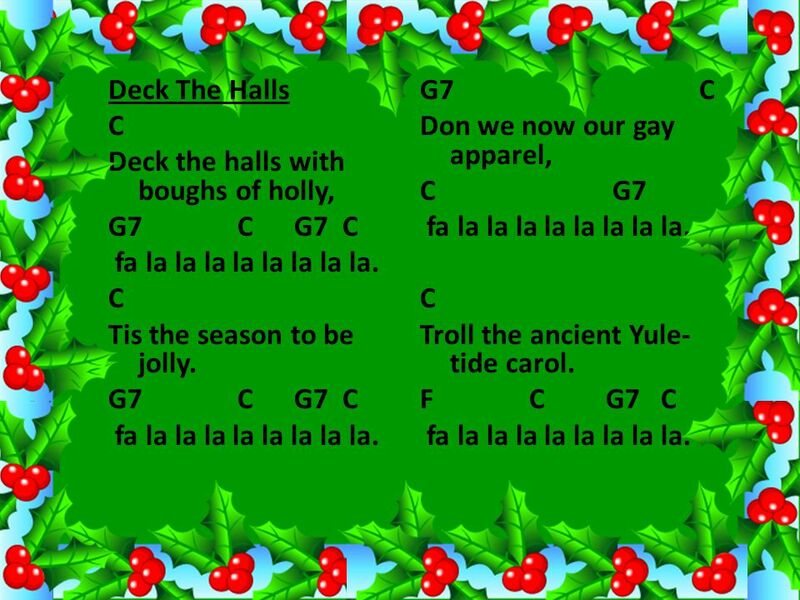 Tung bung Deck the halls Deck the halls - With boughs of holly Fa, la, la, la, la, L, la, la, la. Christmas Traditions in the U.S.A.. Christmas Tree. Holiday Lessons Mrs. Sandra Hendrickson General Music. Recorder Holiday Tunes By Mrs. Sandra Hendrickson. Houses are decorated with holly and mistletoe. THE STAR-SPANGLED BANNER Oh, say! can you see By the dawn’s early light, What so proudly we hailed At the twilight’s last gleaming, Whose broad stripes.